The Beauty of Having Mexican Heritage. 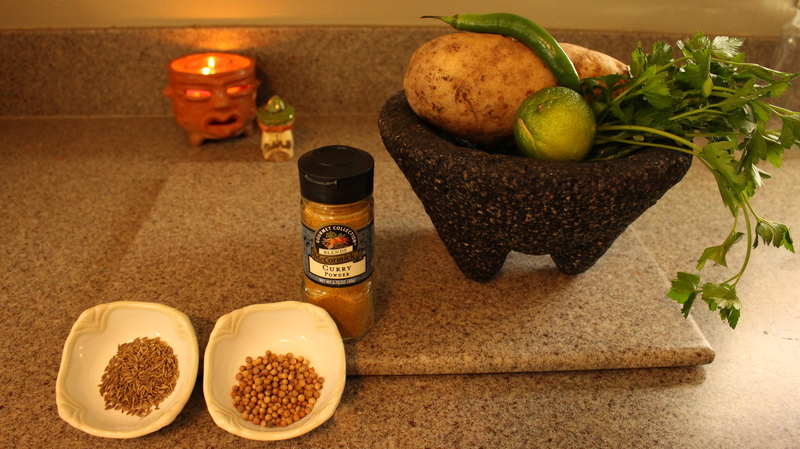 Yesterday, I had this weird urge to cook something that had a nice blend of Indian spices with a “Mexican” twist. So I conjured up a “EMPASOSA”, an empanada/samosa (named by my daughter). I started to think about how the spices I was using were used both in Indian dishes and in Spanish and how much I enjoyed that particular blend. I started thinking back to a Chicano Studies class I took in college and how I learned of all the different cultural groups that came to reside in Mexico. Generally, the word MEXICAN or MEXICO is associated with a short, stubby, brown guy with a huge mustache and an unmistakable accent. The truth is, Mexico is so diverse in culture that to generalize us really just shows ignorance. I have family members who have blue/green eyes and light-complected skin to having skin dark as night and everywhere in between. If you travel throughout Mexico, you will see these differences. Not only does the skin and eye color differ but physical traits as well. I can say this is the same of my fellow South-American brothers and sisters. Recent studies have shown that the majority of Mexico’s foreign residents are from U.S. followed by Spain and Guatemala. Recent immigration flow to Mexico has been from Guatemala, Honduras, Belize, El Salvador, Costa Rica, Panama and Nicaragua. But in the 19th Century (1800s) there was a huge immigration flow from France, who’s descendants are now scattered mostly through Jalisco and Michoacan. In the early 1900s, there was another immigration wave from France. Many of those immigrants currently reside in Chihuahua, Guanajuato and Baja California Sur. Mexico also had a large number of Chinese immigrants during the late 1800s to early 1900s. President Porfio Diaz wanted to modernize the country so the Chinese came to build railroads and such things. Their immigration was also documented in the early 1600s. Currently, Mexicali and Mexico City have the largest Chinese communities in Mexico. Arab immigration also took place during the 19th and 20th century. The majority coming from Lebanon. And let’s not forget that there is also a large Jewish population in Mexico. Why even mention this? To show that being Mexican isn’t about being brown, short and whatever other stereotype associated. Having a Mexican heritage means being rich in so many ways. We have so many influences that make us a unique blend. I know we can’t forget our “Mexica”/Aztec/Mayan roots but the Mexicano is a beautiful blend as well. We are all diverse and have so much to offer. What’s so amazing is that it doesn’t stop there. Those of us that have been blessed to be born in America have another blend of unique additions to our one of a kind culture. Knowing all this, I can understand why I have this attachment to the mesmerizing sound of a Flamenco shoe hitting a hard wood floor as the beautiful blend of the Arab/Moor influence bleeds through the guitar strum of a tango melody. I can understand my love for delectable Indian food. Most importantly, I can understand my love for travel and knowing the world.